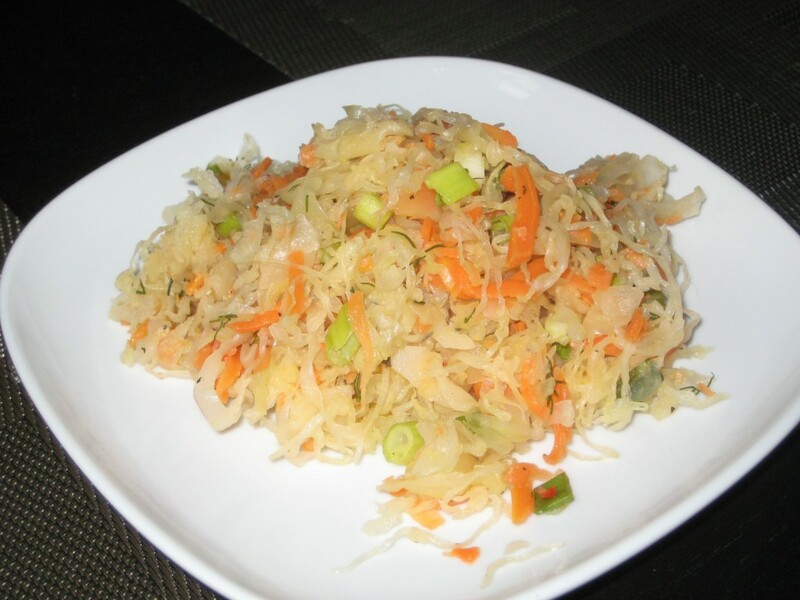 Sauerkraut is finely shredded cabbage that has been fermented. Raw sauerkraut is very healthy. It is an excellent source of vitamin C, lactobacilli and and other nutrients. Studies suggest that fermented cabbage may be even more beneficial to health than the raw vegetable, with increased levels of anti-cancer agents such as isothiocyanates. Sauerkraut is very popular in Polish cuisine and used in many meals as base ingredient. In this video recipe I will show you how to prepare tasty Sauerkraut Salad, which can be a great side dish for lunch or dinner. Posted in: Salads. Tags: apple, carrot, onion, sauerkraut. My sister & I used to eat this wonderful salad quiet frequently when children in Poland. We were recently reminiscing about our favorite foods and we looked up this recipe and voila – exactly as we remembered. I prepared it tonight and forwarded the recipe to my daughter Miranda and her brother Szymon Skoczek. Thank you souch!